Just when you thought we had seen enough of the Leopard print trend….it is still hanging on strong through Spring and for Fall 2010. However, this time it is done in a different way. In season’s past, Leopard prints have been shown mixed with other prints, styled in a feminine way, or paired with exotics in Roberto Cavalli’s classic representation. This season, leopard prints are used in a minimal approach keeping inline with Fall’s paired down dressing. Think of it in more as a Utilitarian trend, sort of how camouflage would be used within an Army uniform. The most important thing to note when wearing updated Leopard prints is the color palette they are combined with. 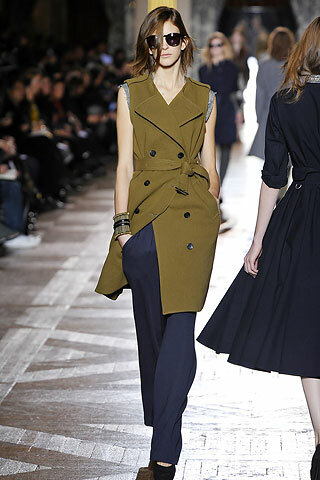 This time around, pair with Fall’s key color palette: CAMEL, OLIVE GREEN, GREY, NAVY and BLACK. Leopards feel right at home with CAMEL. Just as camouflage prints work well with colors in their print, so do Leopard prints. I saw women all over Paris and London wearing Leopard in this way. The piece chosen was always either a coat, scarf, pair of shoes, or a handbag. 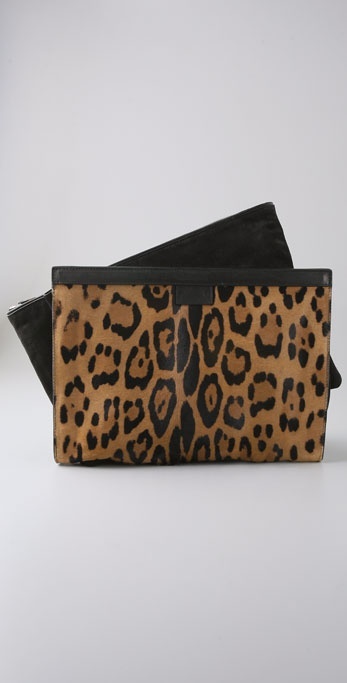 The Leopard was used as a the one print in their Utilitarian chic style. The key to this look is that it MUST be combined with neutrals, rather than opting for its usual black pairing. Dries Van Noten’s Fall 2010 collection has been noted as one of the best in recent reviews and represents this trend very well. 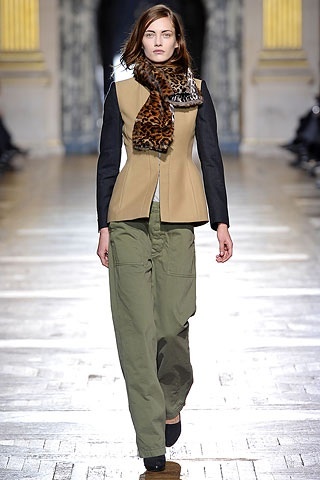 His take on Utilitarian combines casual sweatshirting with formal fabrics in a minimal and refined approach to beautiful dressing, He frequently uses leopard scarfs, shoes and coats paired with menswear tailoring and military fabrics for this Fall’s “Leopard Printed Army”. 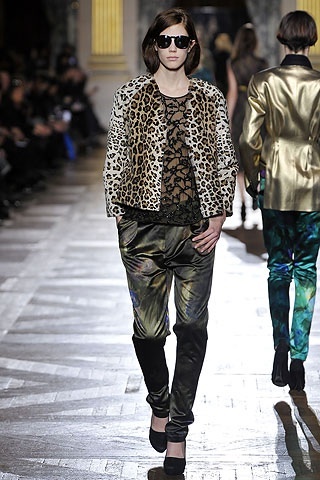 Dries also showed leopard with some of his classic painterly prints in bright green. Kelly green is a great color trend that will be coming down the pike which I will report on soon. The camel canvas wedge lace up's seen here and above were EVERYWHERE and worn by many of the fashion elite paired with the neutral color palette referenced before. Outside of Balmain, paired with grey jersey tuxedo pants. This utilitarian look of pairing grey sweatshirting with finer fabrics is seen on the Dries runway. This look replicates what was seen on Dries Van Noten's Fall runway. A Leopard print scarf would be a great investment for your Fall wardrobe. The ensemble below is a great version for Spring that will carry into Fall. This look also has a military vibe combining red with spiky metal gold bracelets and leopard hidden wedges. This woman was Tres Chic! I loved seeing this editor around the shows, she would work on her computer between presentations sending in constant communication. I love the classic pairing of red, gold and leopard. 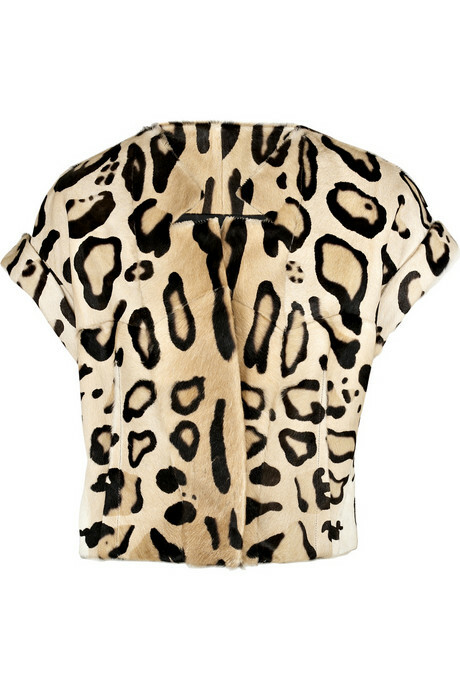 This leopard print goat hair jacket by Giambattista Valli will do the trick for a mere $4300.